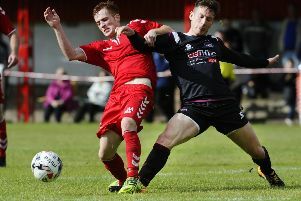 Tommy Coyne took his Linlithgow goals tally to 301 not out as Rose eased through to the third round of the South Region Challenge Cup, writes Susan Hill. Having exited two cup competitions already this season, the tie against Heriot Watt University was not one they could afford to lose. But the ever-reliable Coyne’s landmark 300th goal in Rose colours sparked a goals burst which included his 301st and had the game done and dusted by half-time. Rose got off to a bright start and should have taken the lead in only the third minute when Coyne’s cross found Ruari Maclennan at the near post, but instead of tapping the ball into the net he sent the ball inches past the far post. In the 21st minute Kevin Watt tried an ambitious shot on the volley but it was narrowly off target. But four minutes later Rose made the breakthrough - and a piece of history. Gary Thom’s fine diagonal pass was controlled by Coyne who beat his man before sending the ball from an angle under keeper Callum Reid to score his 300th competitive goal for the club. A few minutes later Watt’s shot was blocked by Reid’s legs, and then the striker headed over the bar when it looked easier to score. Coyne’s cross come shot was cleared off the line following good linkage with Kevin McKinlay and Watt’s header from Kyle Turnbull’s cross was saved by the keeper,. But within a couple of minutes Watt had his name on the scoresheet again, this time beating the offside trap to head home Robert Sloan’s chip back into the box. In a rare attack by the visitors Singh’s shot was stopped by Kyle Marley, but four minutes from the break Rose went further ahead. After good play by Blair Batchelor and Roddy Maclennan, the latter slipped the ball through to Coyne who fired the ball past Reid. 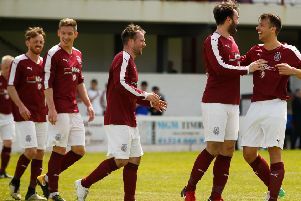 Will Tommy Coyne’s 300-goal Linlithgow Rose tally ever be repeated? Rose scored their fifth just two minutes after the restart as Roddy Maclennan’s shot hit off a defender, wrongfooted the keeper and trundled into the net. Despite the scoreline, Heriot Watt didn’t give up, and Shrive clawed a goal back a couple of minutes later with a nicely worked goal. Rose could have added to their tally when a long ball from Marley was taken well by Roddy Maclennan but his shot was poor and straight at the keeper. With 15 minutes remaining, Heriot Watt’s Lane shot well wide of the target, while at the other end, Roddy Maclennan had a shot off target before he hit the bar with a header. Just before the final whistle sounded, the Maclennan brothers, Coyne and Owen Ronald linked well and all Roddy Maclennan had to do at the end was tap the ball into an empty goal at the back post but somehow he put the ball past the post. Nevertheless it was a convincing win for the Rose which sees them advance to the next round and a landmark occasion to savour for record scorer Coyne.